Hope they aren’t making too much of a mess. Maybe try a few for tea! 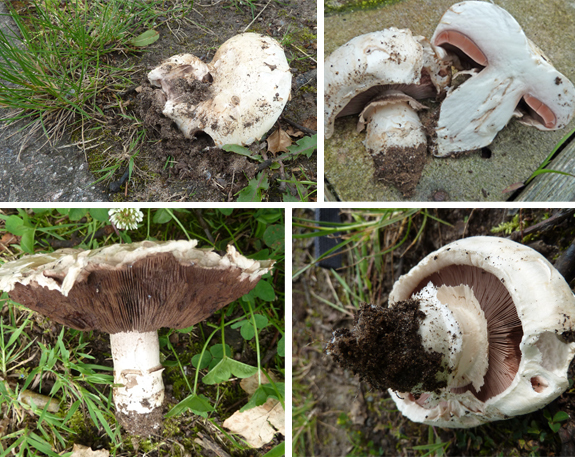 I love wild mushrooms but I’m always sick after eating them nowadays, I don’t know why…..
mushroom as they look like field and/or horse mushrooms. They can cause sickness in some people. I’m begining to think I live in an area completely devoid of mushrooms if even these ones arn’t popping up! 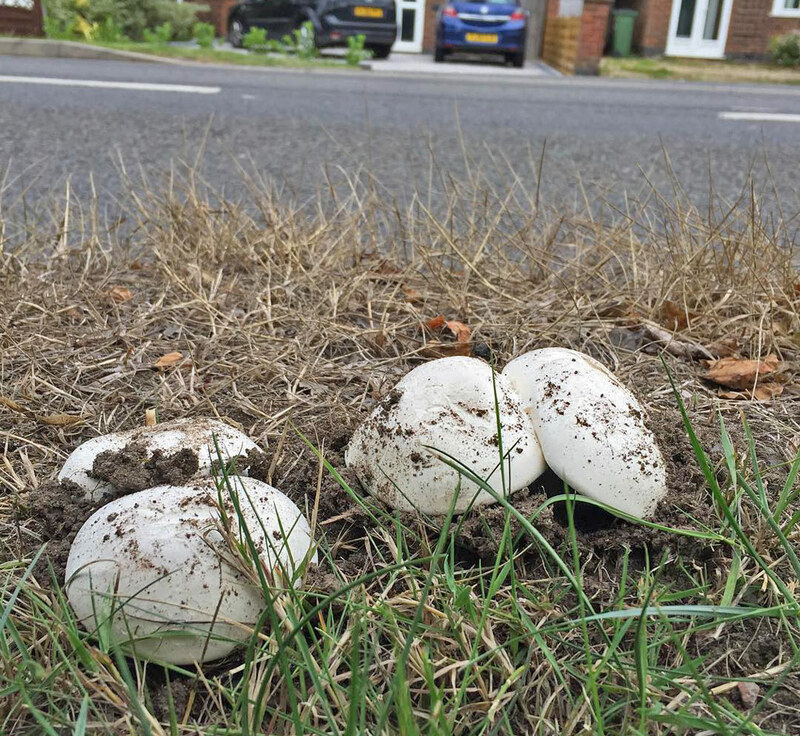 I see lots of pavements and joining grassy areas yet no Agaricus bitorquis! Don’t fear too much Varsha, they aren’t incredibly common. But around this time of year, looking around local grass verges and hedgerows often comes up with the goods, even if they’re inedible. Good luck. I find it odd that I’ve not come across the usual Oysters which are usually in abundance in my local woods at this time. I was hoping to pick some to comsume for once and I see hide nor hair of them! I may have to adopt a new woodland methinks.. The damp weather’s brought blackening waxcaps and brown rollrims (eek, I don’t have anything to do with them!) out on the grass verges in Grantham. No sign of anything good like giant puffballs though, anyone seen them yet? I’m having the same problem finding those Giant Puffballs Sue, some others aren’t though, as I’ve had people send pictures already. Another enquiry was asking (what I thought from the pictures) to be a Blackening Wax Cap. They’re out kind of early(ish). And I agree – stay clear of those annoyingly common Brown Rollrims! Thanks JC, glad to hear someone else has seen Blackening Wax Caps, they’ve appeared earlier than usual here. I wondered if anyone has seen fly agaric yet – will the wet weather be auspicious for its appearance? Thanks Sue. Good luck in finding some good Fly Agarics soon. Bitorquis grows in my driveway , shows up several times per year, and is a very good and welcomed mushroom, except when it pushes up the blacktop. It is always filthy and gritty, but the garden hose set to a fine spray, cleans it nicely. 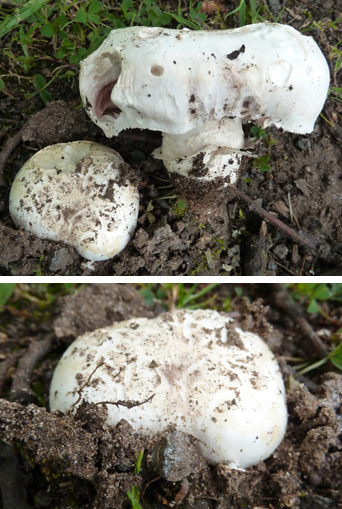 Bitorquis is one of the densest fleshed mushrooms. I can hardly wait for it’s reappearance. It’s good to a reliable supply every year. I’ll be checking round the corner for me and grab them before they get too fumigated by car exhausts!